Converting your LPs, cassettes or tapes to CDs is a great way of storing and playing your favourite music. You can now listen to your LPs in the car, on the computer etc. - anywhere you have a CD player - and the sound quality does not deteriorate like it does with vinyl or tape. If you convert the tracks to MP3 you can store the equivalent of a dozen LPs onto a single CD to play on an MP3-compatible CD player. With a software MP3 player like WinAmp, or a portable MP3 player like the Apple iPod, you can play any mix of tracks you like. Either way, you can play your music as often as you like, without damaging the originals. If you have already tried to do this you'll have discovered how fiddly and time-consuming it is, recording each track as a WAV file to record to CD or converting it to an MP3 file. 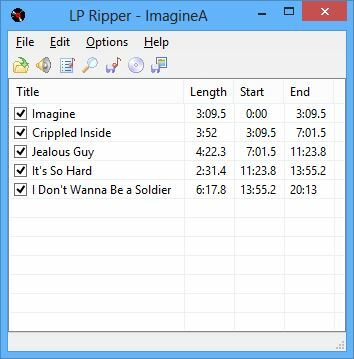 Alternatively, LP Ripper can use a command-line MP3 Encoder to produce an MP3 file for each track ready to be used by iTunes or similar MP3 library software. Listen to previews of the tracks. 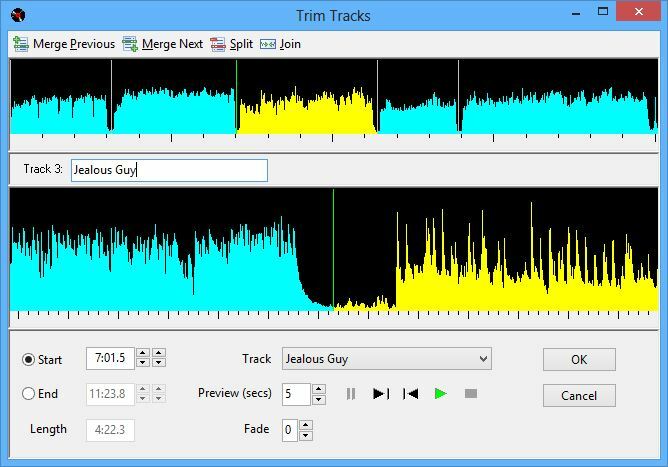 Adjust the fade-in / fade-out of selected tracks – useful for live recordings. Replace the hiss between tracks with silence. Save editing progress between sessions. Trim the start and end of each track visually to a precision of 0.1 seconds by dragging the track marker on the graphical display. The upper display shows the recording level of all of the tracks, highlighting the track you are trimming. The lower display shows the track you are trimming in detail. Track detection is lightning fast. You can experiment with different sensitivity levels and numbers of tracks in seconds. Insert silence before and after tracks. Optionally store MP3 album title, track name etc. (ID3 Tags) with the MP3 file. Control MP3 or WMA Encoder quality with a slider control. Download the trial copy of LP Ripper. It includes all features of the registered full version for you to use for an unlimited time except that it only saves the first two tracks.